Greetings from Las Vegas, land of buffets and broken dreams. I've played my favorite slot machine, Lord of the Rings, and had a steak. Once I hit the outlet mall for some serious discount shopping, my Vegas triad of delight will be complete. I want to share a super opportunity with you. Daisy Carter, from the Fresh as a Daisy blog, is hosting a pitch contest with Tricia Lawrence of the Erin Murphy Literary Agency on 6/29. Daisy's contest is now closed. In fact, I'm over at the Journeys of Wonder blog doing a guest post on editing. Pop on over. Ooh Vegas, how cool! Hope you won lots of money. Congrats on the release and that was a great guest post. Have fun in Vegas! I hope the heat isn't too unbearable. Ah, Vegas. That odd, yet interesting city of adventure. I hope it's not too hot. I have my copy of Wonders already! Thanks so much for the guest post! Your notes on editing are fantastic...have fun in Vegas! Oh yeah! Vegas!! Hope your trip is AWESOME. So glad you're having fun at sin city. I've been there a few times just passing through. Did stay at Circus Circus once, though. And pigged out at the cheap buffets. Yummy! I'm not a rambler or a gambler so it wasn't my cup of tea. Or rather, my shot of whiskey. LOL. You are having way too much fun, Leslie. Party on! Thank you for all your good Vegas vibes. The penny slots were kind to me. New buffet find: Planet Hollywood's Spice Market. Yum. DAISY'S CONTEST IS ONLY FOR TODAY, FRIDAY, JUNE 29th. Get those queries in. Awesome! Hope you're having a great time in Vegas!! I love the penny slots too... thats as far as my gambling goes. I just like cruising the posh hotels and shows. Cirque du Soleil's O is awesome!! I'm there with you in spirit, Leslie. Anything to get away from this rain. Eight long days. I love those musical machines. Gawd, the first time I set one off, I must have jumped 10'. Haha, quite a spectacle. Hope you have a lovely time. Ooh, hope you had fun in Vegas. I've always wanted to go, just out of curiosity. We just got back from a surprise weekend in Montreal (it's only about 3 hours away) and it was so much fun to shop and eat and listen to music outdoors and get a break from my kids (however wonderful, adorable, and loved they are). 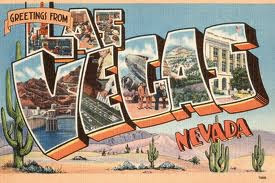 Wow Leslie, I hope you had an awesome "triple-whammy-Vegas experience"!! Are you back? Continue to have a blast if not:) I've never been to Vegas, but have always wanted to go!